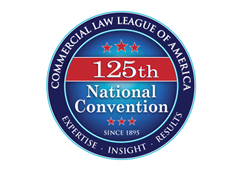 The Commercial Law League of America respects your privacy. We have created this privacy statement in order to demonstrate our commitment to our members and visitors. This privacy statement discloses the privacy practices for this site, www.clla.org. We will never give any information about you to others without your express permission. Our site uses forms in which you give us contact information (like your name, address, and email address) so you can place orders, request information and support, and make product suggestions. We use your customer information only when it will be important for us to contact you regarding functionality changes to our services or products and our web site.